Any of several wormlike marine mollusks (not true worms) of the family Teredinidae, that bore through the wooden hulls of ships and other woody material immersed in salt water. Old spars and water-soaked timbers cast on the beach are full of the workings of the shipworm—long cylindrical tunnels penetrating all parts of the wood. Even though mankind has tried to develop counter measures for thousands of years, still there is no easy solution to the shipworm problem in sight. In our waters, however, the shipworm seldom attains a length of over a foot-and-a-half long. 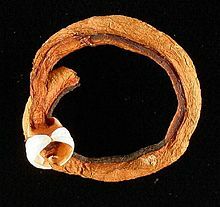 Shipworms are not worms at all, but rather a group of unusual saltwater clams with very small shells, notorious for boring into (and eventually destroying) wooden structures that are immersed in sea water, such as piers, docks and wooden ships. Sometimes called "termites of the sea", they are marine bivalve molluscs (Eulamellibranchiata) in the family Teredinidae, also often known as Teredo Worms.